Last June, a conference was held on the subject of treatments and clinical trials for children diagnosed with cancer. This was the first conference on this subject in Israel, organized by Larger Than Life in cooperation with the Rambam Pediatric Hospital. Leading this conference was the Director of the Hemato-Oncology Department of Rambam Hospital, Professor Miriam Ben Harush. Members of the conference included 70 doctors, specialists, nurses, and researchers from different medical centers throughout Israel. “The goal is to decrease the use of chemotherapy treatments which, aside from damaging and killing cancer cells in the body, also damage the body’s healthy cells and cause painful side effects, and to replace these treatments with new drugs that target only the cancer cells and are tailored specifically to each individual child in order to reduce side effects,” states Professor Ben Harush. Participants of the conference were briefed on new experimental drugs by the heads of the organizations of clinical trials in Europe and the United States. They had the opportunity to consult, exchange opinions, and discuss cases of patients that they were debating different treatments for with the heads of these organizations and other participants. After the conference, some of the participants paid a visit to Larger Than Life children’s educational center, Kindergarten of Dreams. They sat on the tiny chairs and experienced the most unique project of the organization – the only preschool in the world for children diagnosed with cancer. 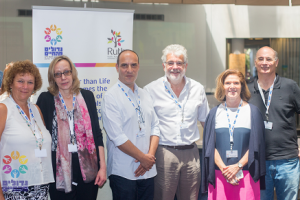 In the image above, from right to left, Professor Rechvi, Professor Ben-Harush, Dr. Morland, Mr. Lior Shimoni, Dr. Vidman/Widman, and Ms. Geula (Gooli) Keshet.